While I fancy myself a pretty adventurous eater, (hello, have you had bull testicles?) I tend to play it relatively safe when it comes to beer drinking. I’m a wheat beer girl, IPAs remind me of the time I accidentally sprayed perfume in my mouth, and anything too red or dark is a chore to drink. At most, I’ll go for citrus notes. I like beers that are light and crisp and go down easy. Boring, even. But even though it goes against everything I look for and prefer in a beer, the second I read about Grimm Artisinal Ales’ Sumi Babka— an imperial milk stout inspired by ding ding ding! You guessed it: babka— my mouth practically started watering. Babka, you see, is one of my favorite things ever, especially the chocolate variety. That soft, doughy swirl of a loaf gets me every time. It’s good with coffee or with tea, topped with ice cream or just eaten one torn-off hunk at a time, and now it turns out, it’s also good in stout form. Made with cacao, salt and vanilla, the Sumi Babka has a smooth, velvety feel, noticeably chocolatey but not overwhelmingly so, never cloying or syrupy either. At 12% alcohol by volume, it definitely packs a punch but doesn’t taste super heavy or strong. I only didn’t have a second one because Grimm has such an interesting and fun assortment of brews, I felt I had to make the most of my time and try different ones. Next time I go, (which I’m hoping is soon because I was a big fan of Grimm’s brewery and taproom) I’ll skip the weiss selections I would normally go for (of which Grimm has several that look good) and beeline straight for that babka stout instead. I’ll just have to bring some chocolate babka with me to complete the experience. Beers and brownies… that’s a thing, right? Side note: In lieu of babka, Grimm does have a pretty delicious chocolate-tahini brownie from nearby Mediterranean spot, Samesa. Speckled with sea salt flakes and made of a creamy, moist chocolate, it’s definitely a bit more on the dessert side than babka, but you know who’s not complaining about that? This girl right here. 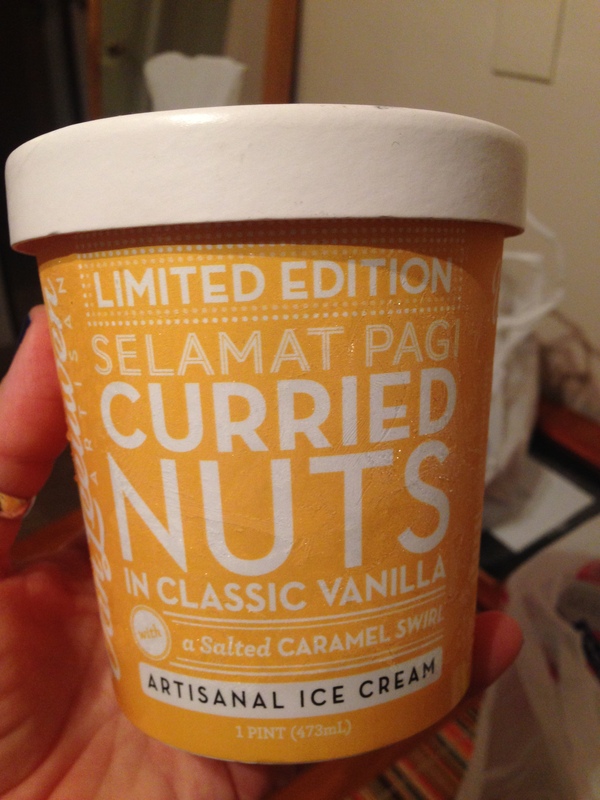 I was in exactly this state of mental turmoil Sunday night when I saw a pint of Van Leeuwen ice cream that stopped me right in my indecisive tracks: the limited edition Selamat Pagi curried nuts and salted caramel swirl in vanilla ice cream. Boom. Decision made. 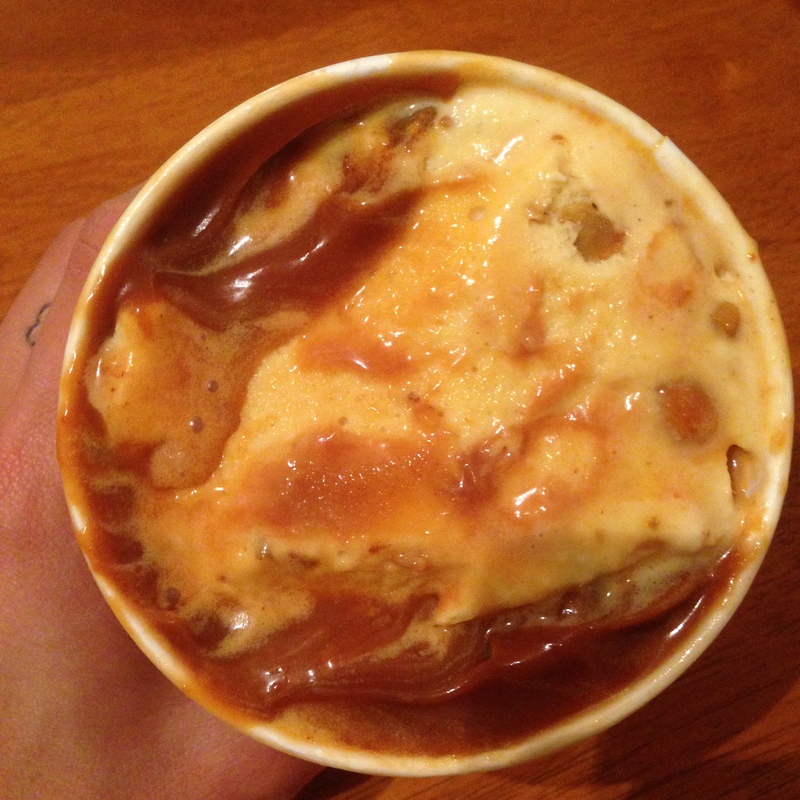 No sooner had I run home, than I threw everything on the kitchen table and without unpacking anything other than my pint of ice cream, dug a spoon right into the soft, gooey, caramely heart of it. It was simultaneously smooth and creamy, sweet from the vanilla and savory from the curried nuts, just a hint of salty from the thick ribbons and swirls of salted caramel and both spicy and crunchy from the nuts. It took everything in me not to eat the whole pint in one ravenous sitting. So instead I polished off half right then and there (in front of my unpacked groceries) and the other half the next night. It was some of my finer decision making, if I do say so myself. I’m back! Here I mean. Back to blogging! I did that thing where I kind of disappear from the ol’ bloggity blog and keep thinking about how I need to get back to it, and then I just keep procrastinating, and stockpiling food pics, and feeling bad about not writing and then BAM! I get my act together and I come back. So yea, here I am. So where’ve I been? Oh, around. Getting properly settled into my new apartment, working, hosting out of town friends, spending a weekend in Atlanta with my sister, and most recently, traveling to the Dominican Republic for a good friend’s destination wedding. All of that with the usual gallivanting in between. Peach cobbler? Good. Peach cobbler in bed? Great! I’ll get into more detail about ATL and the DR over the next few days, cause I did some really good grubbing in both, but for now I’ll leave you with a snap of the freakin’ delicious peach cobbler a la mode I had in Atlanta. 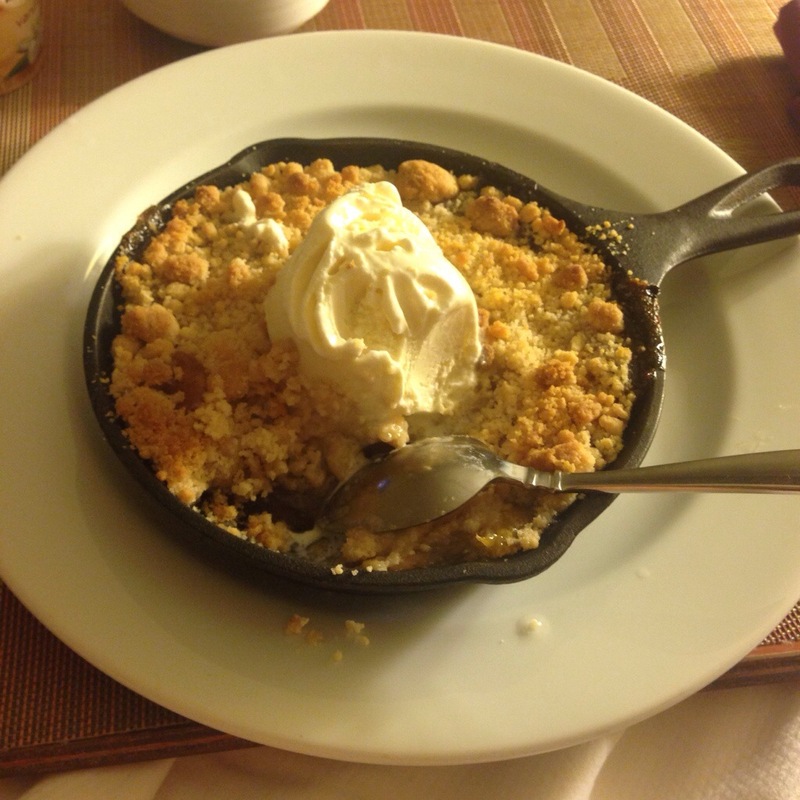 Not only was it perfectly warm and gooey on the inside with a delicious crumbly streusel top and a fat scoop of vanilla ice cream, but it was a thousand times more decadently delicious cause I ate it in bed, in my PJs, with my feet propped up while watching Wedding Crashers in my hotel room. Absolutely freakin’ delicious, like so many nights I’ve had in the time I’ve been away. Wait till I tell you all about ’em. Go me, it’s my birthday! To celebrate this momentous occasion, I’ve decided to make like Feivel and head west, to California, where I’ll be visiting old friends, new places and hopefully forgetting about the closeness of 30. Nothing puts the happy in happy birthday quite like chicken and waffles ON TOP of a cupcake. But really, the celebrating started a few days ago when my ah-ma-zing roomate and dear good friend bought me chicken and waffles cupcakes from Yaya’s Cakes in Crown Heights. 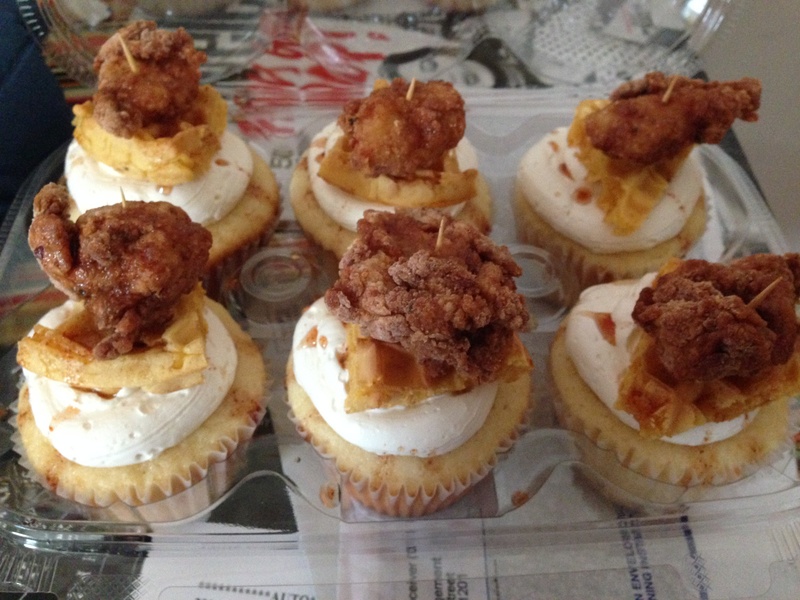 Yup, go ahead and let that settle in your head: chicken and waffles cupcakes. Vanilla buttermilk cupcakes topped with vanilla maple buttercream, a wedge of waffle, a hunk of fried chicken and a spicy maple drizzle. Every bit as over the top and delicious as they sound. Now, THAT’S how you properly kick off a birthday! Next stop, sunny California! I’ve said it before and I’ll say it again: I love yogurt. I think most people feel pretty lukewarm about it, but I actually love it and eat it most days. I especially love plain flavored Greek yogurt for its thick, creamy consistency and rich, tangy flavor. 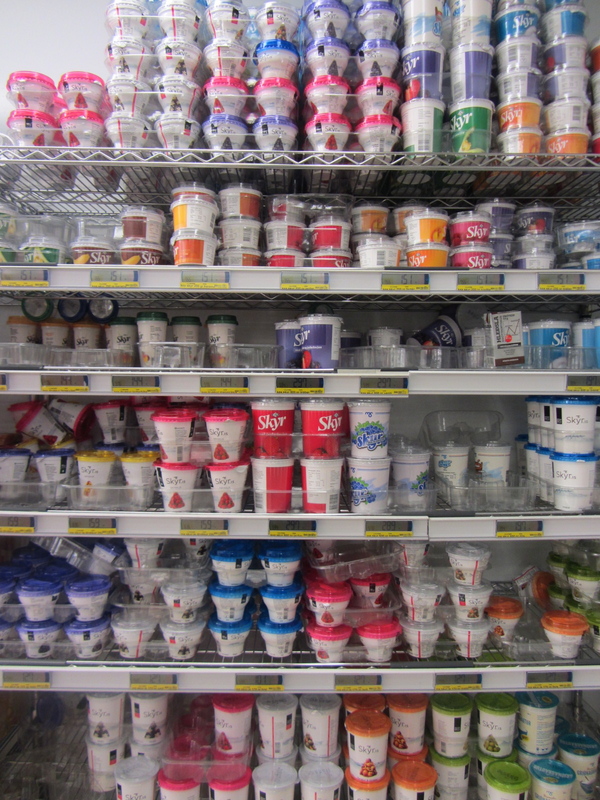 Before going to Iceland, the one thing I knew about local eating habits there was that people were serious about skyr, an Icelandic yogurt of sorts, similar to the Greek kind in its consistency, flavor and high protein content. And really, that was almost enough for me to fork over plane fare. 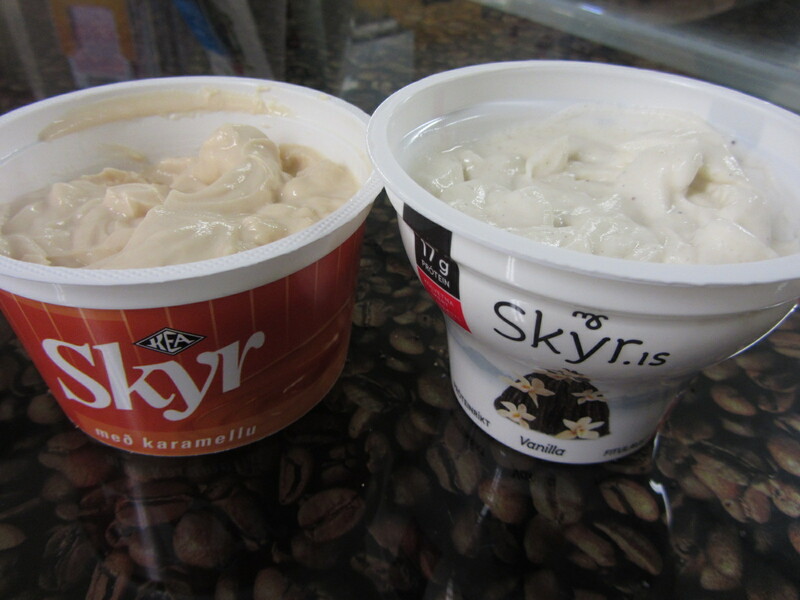 Sure, all of the other awesome things about Iceland sealed the deal, but really, I was sold at skyr. Skyr: non fat and high in protein, yet tastes like a complete dessert. Once my sister and I were there, skyr really was everywhere and I, for one, thought it was great! At supermarkets, there were dozens of brands and flavors, including plain, fruity like blueberry and raspberry, or sweeter varieties like vanilla and caramel. 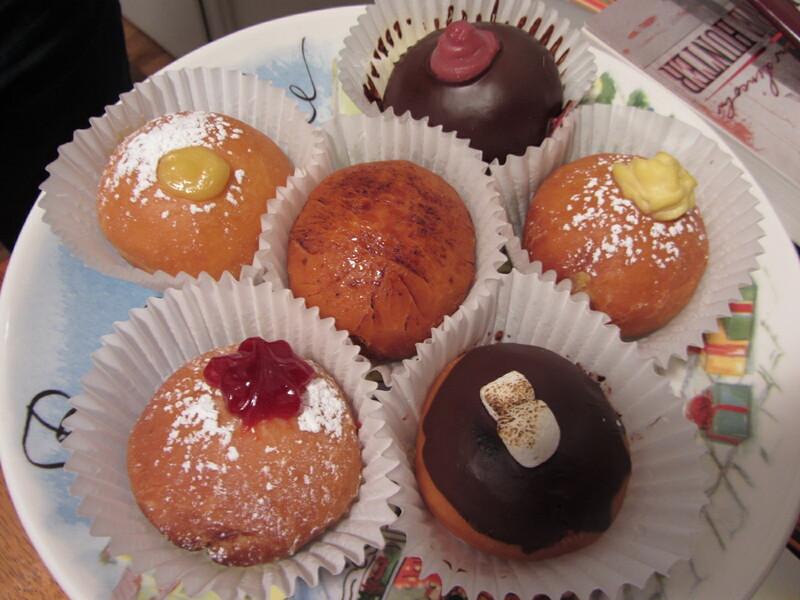 In my six days there, I tried a bit of them all. Because I’m a big vanilla fan I really liked that one which was almost custardy, but the caramel one was really good too, in a very flan-like, almost dessert way. Oh that all mornings could start with this much deliciousness! At Kex, the hipstery hostel where we stayed, skyr was always a part of the morning breakfast line-up. The tart, plain flavored kind was served in small glass jars and left up to the eater to jazz up with an assortment of oats, granola, jams and dried fruits. 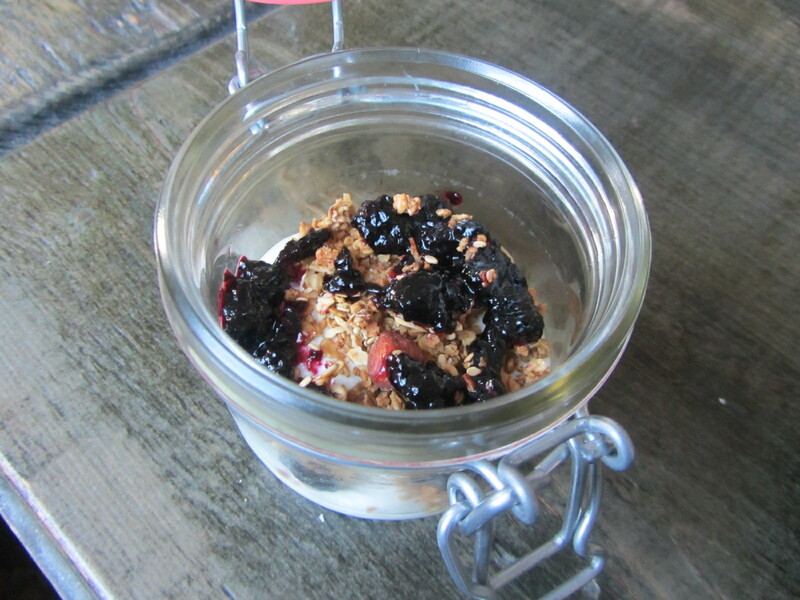 My favorite combo was the dark, rich blueberry jam they put out (which by the way, was delicious and I would have eaten with just about anything) and the crunchy, nutty granola. I had it that way the first day we had breakfast there, and every morning we went back. Lucky for me, places like Murray’s and Whole Foods actually sell skyr, so an Icelandic morning dairy fix is never too far. And as a devoted yogurt lover, that makes me very happy. The ambiance was cozy and intimate, with that cooler-than-thou hint of exclusivity that pervades so many places in this neighborhood, but it was the Fraise Sauvage, French or something for “delicious and best smelling cocktail in the world,” that really sold me on the place. Like almost everything else in New York, the drink was about three times the price I’d pay in a normal city, but then again, no one moves to New York looking for normalcy, now do they? 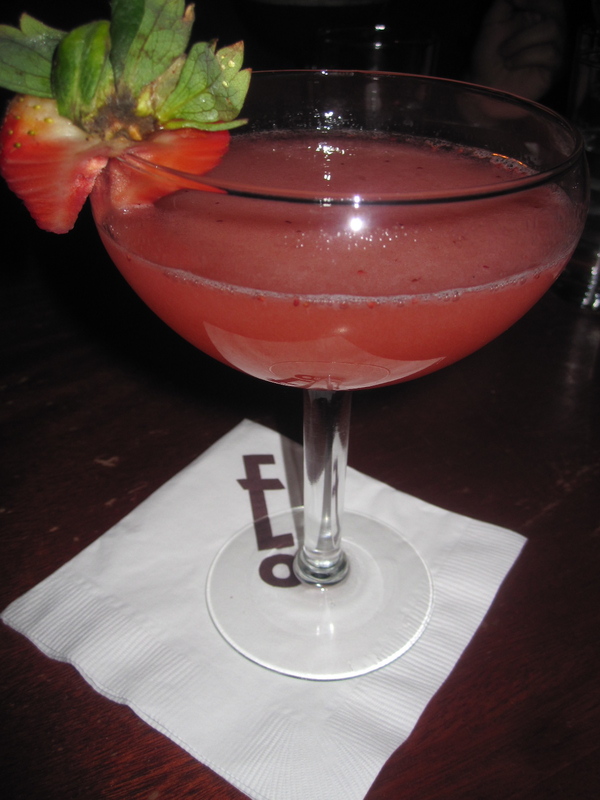 Plymouth Gin shaken with wild strawberries and Tahitian Vanilla, topped off with Zardetto prosecco di Conegliano Brut. Fizzy, sweet, tart and with a bold taste and bright aroma of juicy, fresh wild strawberries.